The bright pops of color and stripes in this Fire Island home designed by Alexandra Angle Interior Design make me really happy. There is something about yellow that screams summer, right? This brilliant colorful chair (which is also in this home) is what led me to see more of Alexandra Angle's work! Aren't those colors just LUSCIOUS? 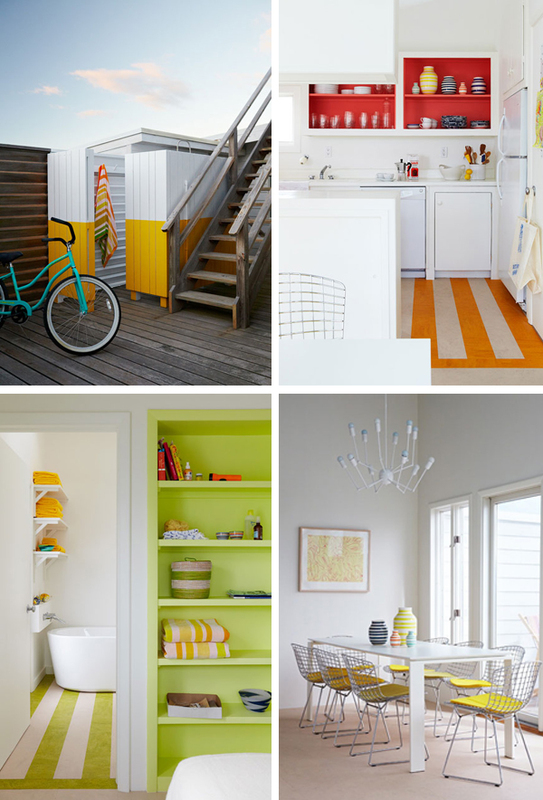 I especially love the citrus accents in the kitchen. LOVE how those pops of color are executed - so so fresh! yellow and white match really good! and the kitchen is so cute! grate ideas. The white with the pops of color truly reads like a breath of fresh air. Oh wow that is so colorful and cheery. I'd be very happy to live there. It really is a happy space. Love it! Love the yellow and white. Wow.amazing. Contolled yet colorful. great find, thanks for sharing! Oh I love all the bright colors! I can't imagine a better color scheme for Fire Island - it's very beachy and fun! I love these. They just say summer happiness. I love the pop of yellow on the chairs among all that white. I love this home. It's so beautiful and the colors looks fresh. I just love its happy colors, it was perfectly executed! great inspiration, exactly where i'd want to vacation! I want to come stay and hang out for a week or so here...very bright & happy!